After all the pressure and perseverance, Microsoft has confirmed that windows mobile phones will be discontinued. 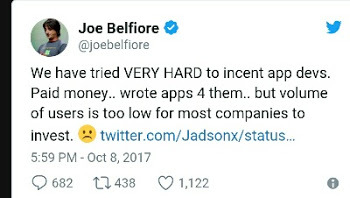 Microsoft’s Joe Belfiore has revealed that the software giant is no longer developing new features or hardware for Windows 10 Mobile via some tweets on Twitter hours ago. During the recent Windows 10 Fall Creators Update development phase, it has been obvious Microsoft is no longer working on the mobile experience. The software maker branched its development process into “feature2,” leaving Windows Phone fans disappointed. 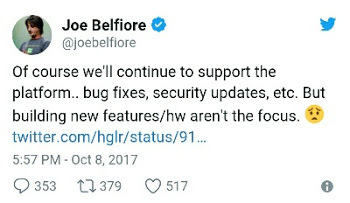 Belfiore also admits he switched to Android, just like Bill Gates, and that Microsoft will support Windows 10 customers who want to use Android and iOS on their phones. One of the big reasons Microsoft is giving up on Windows Phone is because developers never backed the platform. Microsoft said the demand for Windows phone were too low that they couldn't continue. this is a sad news to hear about. The public opinion is that things are not going well for HTC, even reports emerged that HTC was considering selling off only for the reports to fine tune into Google hiring HTC’s top engineers for a collaborative project. However HTC is not doing very badly as their financial statement for last month showed very healthy fortunes. Announcements coming from HTC revealed that its revenue for last month more than doubled up. According to the official figures, released by HTC, revenue for the month of September grew to US$215 million exceeding a double of the revenue declared for the month of August. Shipments to Google by HTC would probably have the major inspiration for the leap in fortunes for HTC. Especially as HTC played a fundamental role in the production of the Google Pixel 2. But it is not all yet galore for HTC as they are still on the losing side when yearly gains are calculated. We expect more from HTC before the end of 2017 as we anticipate a range of HTC devices to be released this year especially for the U11 Plus expected to reduce heftily on the bezels composition. For some time now, Microsoft has been touting the idea of incorporating its virtual assistant Cortana with Skype. All the way Microsoft has been striving to push in Cortana into all its facilities and it was all natural Cortana soon made its way to Skype. After so much testing, the feature is live now. This was confirmed in announcements released by Microsoft pertaining to the integration of Skype into iOS and Android versions of Skype. Cortana has its advantages that it brings on board. One of these ways in which we will find Cortana relieving is its in-context assistance. This judiciously gets you helpful suggestions based on the context or topic you are discussing with your conversant in your chat. Aside that, Cortana when dutifully embedded can help you with suggestions of movies, reviews as well as help you with reminders of your event and schedules. Now that Cortana is on Skype, it can take on the responsibility of your contact. So you can chat one on one with Cortana. And Cortana can help you with stuff like the weather predictions, checking out your flight status, stock quotes and all that. For now, the integration of Cortana into Skype is in the U.S. and would be rolling out to other countries. Another video of exploding Samsung phone is going viral in social media. This time it’s not ill-famed Galaxy Note 7 but Samsung Grand Duos. The 47-year-old hotel executive Yulianto was waiting in the hall of his hotel in Indonesia where he felt a heating sensation in his breast pocket. If we take a look at the previous year, we have seen Samsung had halted the production of Galaxy Note 7 and dismissed the entire units of it because the phone began to explode after few weeks/months of usage. Not only Samsung Galaxy Note 7, several other devices from Samsung like Galaxy S7 Edge and J7 found exploding in several cases. Now, another video of exploding Samsung phone is going viral in social media. This time it’s not ill-famed Galaxy Note 7 but Samsung Grand Duos. The reports from Daily Mail claims that the 47-year-old hotel executive Yulianto was waiting in the hall of his hotel in Indonesia where he felt a heating sensation in his breast pocket. The entire incident was caught on the CCTV camera of the hotel. As soon as the phone exploded, he fell to the ground frantically trying to get his shirt off for a few seconds before a spectator stepped in to help. Local police had investigated the entire incidence and said that Yulianto had suffered from minor burns. Local police had also added that the victim was using GPS, WiFi and Bluetooth feature simultaneously when it happened. Local media have contacted Samsung after the incidence, the company said that consumer safety is their first priority and they will provide all the necessary support. On the other hand, Samsung had told CNETthat the battery which was being used on the phone was not from Samsung. Here’s what the company added, “We sincerely wish for our customer’s swift recovery, and strongly recommend all our consumers to use Samsung’s genuine or approved batteries that have been specifically designed for use in Samsung products. It is habitual as we know for Apple to be wracking their engineers’ heads to cook up upgrades to their iOS platforms. Such updates come as intermittent solutions to a number of bugs that creep up regularly. The latest coming from is the iOS 11.0.3 update for iPhone and iPad. The updates come in the size of 285mb. This follows hotly on the heels of the recent 11.0.2 update that was released sometime last week. This new update as said is a solution to a couple of bugs that popped up. The first happens to be on the audio as well as the haptic feedback on the iPhone 7 and iPhone 7 Plus. On those devices, those functionalities weren’t smooth with a number of users bemoaning the hitches. The other bug that the new update would deal with concerns input responsiveness which was crept up prominently on iPhone 6S units. These iPhone 6S were particularly those which were repaired with non-genuine parts. Consequent to the release of this new update, Apple has called out against the use of non-genuine parts in the repairs of bad parts. You can download the update via iTunes as well. Not at this time microsoft want to make this decision,i think a rethink should be done on this issue.